Top : Designers : Design Support Services : Structural Composites, Inc. Structural Composites provides engineering, scientific, testing and research & development support to government and industry. Composite prototypes and process development are also key services. Our expertise centers on the optimum utilization of composites theory, real data and experience to solve problems and to provide design, testing and technical support for fiber reinforced plastic (FRP) composites applications. 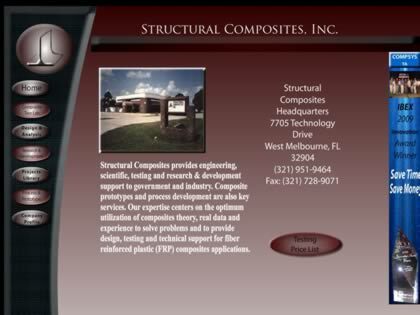 Web Site Snapshot: If available, above is a snapshot of the Structural Composites, Inc. web site at http://www.structuralcomposites.com/ as it appeared when this site was added to the directory or last verified. Please Note that Boat Design Net has no involvement with the above web site; all content and images depicted in the above thumbnail are the property and copyright of Structural Composites, Inc. unless otherwise noted on that site. Description: Structural Composites provides engineering, scientific, testing and research & development support to government and industry. Composite prototypes and process development are also key services. Our expertise centers on the optimum utilization of composites theory, real data and experience to solve problems and to provide design, testing and technical support for fiber reinforced plastic (FRP) composites applications.